I can’t remember when I first heard the term. I do remember how I felt about it when I heard that there was such a thing as a church consultant. It was not pleasant. I was of the impression that it wasn’t anything that a pastor couldn’t do and I was a pastor. I knew the people in the congregation. I knew their hopes and dreams and was doing my best to understand what ministry we might do together. I wasn’t excited about anyone Lee helping with that discernment. It seemed like a waste of time and an even bigger waste of money to hire someone to help us ask the questions we already knew we needed to answer as a church. No, when I first heard the term, I was anything but excited about the idea of a church consultant. I didn’t like it but it seemed like they were everywhere. Church consultants were popping up all over the place. They were the hot new thing but I couldn’t quite escape the fact that these were people who had left full-time ministry. That’s how it seemed to me. These were people that couldn’t hack it as a pastor, but they still thought they had something to offer the church. So they became a consultant. At that time, they were all older than me. They’d been in ministry a long time. They had a resume that I couldn’t fathom and most of them were connected to the now extinct Alban Institute as was true for the church consultant that I first considered hiring. I had a fabulous conversation with this gentleman over email and then on the phone about how we might lead the church I was serving to understand their vision. The church knew that this was a question that they must answer. They were anticipating the retirement of the Senior Pastor and were wondering what their ministry might look like after he left. Ever eager to help, I rose to the challenge and did what I could to help them on this quest. It didn’t work. They didn’t choose to hire him and it became clear that I had stepped into something I hadn’t intended. So it was time and time again as an Associate Pastor. That was then, but now, there are consultants my age. They have resumes like mine and they are immersed in the wondering what the future of the church might be. I’ve learned a thing or two since the first time I heard the term church consultant for the first time. Most importantly, they don’t have all of the answers. They have ideas and questions. They’ve seen some things work in other places but they don’t know what God is doing in this place. None of us do. Church consultants are curious. They are seekers. They are looking to find God in the midst of numbers and figures. They are trying to ask questions that they can’t answer and waiting for the Holy Spirit to show up and make herself known. They have some skills too. They’ve studied change and tried to understand how much people hate it and what we can do to manage the inevitability of change still finding its way into our laps. And even though consultancy is an idea taken from the business world, the ones in the church are really people of prayer. They are open to transformation. It’s what they hope to find every time they sign a contract with a local church. I never expected that I would be counted among this group of people. From the very beginning, when I first wandered into the halls of seminary, I have been called to the local church. I saw myself as a pastor. I still feel that I am a pastor but when I got married to a man in the military, my ministry changed. I got excited about interim ministry and eager to help congregations transition into a vibrant future with God. I got some training and got to use my new skills. And then, we moved… again. I interviewed with another church and they are delightful but I didn’t think I could give them my all. I’m newly married. We are only here for a short time. I just didn’t think I could do both well. So, I turned down the opportunity to be their interim pastor. Tonight will be the first time that I attempt this new thing. I’ll lead the first session in a series of workshops. I’ll meet with the pastor and share in big questions about what God is doing in this group of people. I’ll be one of those church consultants asking questions and looking for the Holy Spirit. There are plenty of days that I don’t feel like I’m a good pastor. I have never felt perfect. I can’t imagine ever feeling that confident in this holy and sacred work. Most of the time I feel like I’m not quite living up to this calling. I don’t even want to get into that. I don’t want to talk about the ways that clergy are held to a high standard of morality and faith which makes it hard to be a person. I don’t want to talk about any of that because what is really on my mind is one particular pastor by the name of Jack Miller. was, in fact, the pastor of that congregation up until 2002. And he’s the subject of the chapter I’m working on right now. For, you see, Jack was my mom’s pastor. When she learned she was dying, when she was trying to come to grips with what that would mean, someone told her to talk to Jack. Someone advised that he might be a good listening ear. And he was. She would sit there in the balcony of that church next to Jack and talk to him about everything she hoped and feared. She dragged us to church on Sunday. She taught me that the church was a place where we could ask hard questions. And that was because of Jack. When she needed it most, Jack made a space for her. He listened. He prayed. He sat at her bedside. As she was dying, he was always at our house. This was weird to me. My grandparents had been church goers, but my parents were not. They didn’t care much for that kind of thing until my mom was dying. When she knew she was dying, everything changed and Jack seemed to be always there. (He wasn’t, of course, but it seemed that way to seven year old me.) Jack made a big impact on me. He was a huge help to my mom but Jack was not perfect. Many years later, the news broke that Jack was being charged with sexual misconduct. It was in The New York Times. I ended up Googling him yesterday. I realized that there were still questions I wanted to ask him. I wondered if maybe I could find him. But, all I found was news story after news story about this scandal. It is revealed how he struggled with his sexuality which may or may not have led to his drinking. The members of that church knew that he wasn’t perfect. They knew that he had some demons. I don’t know if they made the same space for those struggles as Jack made for my mom, but eventually, he was removed. He was forced to resign. He was removed of his ministerial standing. He is, now, what we would call a bad guy. What I’m writing right now in the book I’m writing has nothing to do with this later history. It pains me that Jack’s ministry ended this way. Though, I am not totally sure that’s true. I seem to recall that he continued to pastor a home church made up of former members of that church he was forced to leave. I wish he hadn’t made that move but he is human, just as I am human. He was called into this work and he loved it. That was obvious to me even as a little girl. So, I want to write about that man that presided over my mother’s funeral and sat at her bedside. I want to write about the man who jumped at the chance to take a ten-year old girl out to pizza to talk about the mom she missed. He ate a lot of pizza together. We drank too many sodas and Jack was who he had always been to me. He was someone who would listen. He was a pastor. He guided me back toward the light. He helped me to claim resurrection even if he couldn’t find that same hope for himself. The fact is: I never knew his struggles. Just as the people I pastor don’t know what’s going on in my inner life, I have no idea what was going on inside Jack. It pains me to read these news stories and I don’t want to write about it. Spring is in the air and change seems to be sprouting in every which direction. Colleagues are quietly talking about their discernment. Questions are being asked about how to leave a ministry well and I admit I don’t have solid answers. I have left two churches and I’m still not sure I have done it well. I only know that I miss them both. And now, I’m preparing to leave another. My last Sunday isn’t until October but with only four months of our shared work ahead, I’m starting to think about what’s next. I’m looking at listings. I’m beginning to network as I wonder if there might be an interim opportunity in the next year. At the same time, my colleagues seem to be hungry for questions to ask of search committees. It is a question that keeps appearing and it’s one that I think I can answer. I have, after all, interviewed a lot. I haven’t always gotten the gig but I have been told I ask good questions. Last year, I wrote another post with interview tips for pastors which includes some techie pointers and a few questions to inspire your conversation with the search committee. This is all about the questions. These questions are all geared toward pastors who are trying to learn as much as they can about the congregations with whom they’re interviewing. Let’s start with mood. Every congregation has a particular mood. Some are hopeful. Some are despairing. Some think the sky is falling. Some think that there is endless possibility. Still others are just confused. They want it all, but then again, so do I. It should be possible to read the mood of the church in the paperwork they provide about themselves. But, even if it is not apparent, these mood questions are my favorite for the simple fact that they reveal the church’s heart. What do you most want to learn as a congregation? As Barbara Brown Taylor asks, what is saving your life right now? How do you experience the peace that surpasses all understanding together? As I just heard Krista Tippet ask: As you look around at the world now, what makes you despair, and what gives you hope? The temptation in answering these questions is to answer for yourself rather than for the congregation. Try to nudge toward the congregation’s perspective rather than the personal. When I ask these questions, I request hearing an answer from everyone on the committee. I don’t want to hear their rote answers or even from the one guy that is most comfortable speaking. I want to hear them talk to each other. I want to hear their deepest truth. Bizarrely, this works best on the phone. When I interviewed for my current interim, I asked the joy question while on the phone. I couldn’t see their faces but they concluded by saying, “I wish you were here to see what just happened. I don’t think we just got closer.” Alleluia! The next set of questions are adapted from the United Church of Christ’s A Pilgrimage Through Transitions and New Beginnings. The questions in the packet of materials (it was actually once a binder) provided by my denomination are all geared toward churches. I’ve tweaked them for pastors to ask of churches. You can find the original list found in both Resource 11B and Resource 11C here. What does worship do for your community? What should it do? How do you take care of each other? Who is responsible and how is this labor of love shared by your community? What is your understanding of “good news”? What motivates you to invite your friends to church? Why do you think they should want to join your fellowship? What are you doing to help with that outreach? The role of the pastor is changing fast. How would you define that role? What experiences have contributed most to your growth as a church in the past five years? Have you read books together? Do you go on retreats? Is your adult Sunday School picking some awesome topics? How would you describe God? What is your favorite image of God in scripture? What is your church’s weakness? What is the most difficult thing for you to do together? Each church interviews a little bit differently in my tradition. The norm was once two phone interviews and then an in-person interview. That seems to be changing. Still, I tend to save all of my big questions for the in-person interview. To me, that’s when it’s really serious. In the phone interview, I typically only ask two or three questions but after I hang up the phone, I write down all of the questions I still have. If you are interviewing right now, or attend a church that is going through a search process, I really hope that you’ll complete this survey compiled by my friend Laura Stephens-Reed. Laura has wisely identified that there are some huge challenges that have arisen in churches that have all started with a bad search. (I am serving one of those churches as an interim right now.) Laura also happens to be the one that convinced me that I could do interim ministry. I am eternally grateful as I love it so I hope that you’ll add your thought to this survey. You can read more about the project here. Before you go, please share your best questions. What are your favorite interview questions? Lent is just one week away. Most plans have already been laid out. It’s been printed in the newsletter and in the bulletin. Resources have been ordered. Palms have been burned. (I know because the traffic on this old post on how to make ashes skyrocketed two week ago.) Some have already done their food shopping for gallons of maple syrup and pancake mix for the Shrove Tuesday celebration. To those people, I just want to say: don’t forget the pancake games. No. Seriously. So much fun. In truth, I am one of those pastors that usually plans far in advance. I don’t tend to procrastinate because it makes me nervous. I need a plan even if things change in the midst. I need to have some sense of what’s to come. It’s not just in church that I do this, by the way. But, this year is different. This year, I’m not a settled pastor. I’m an interim which I’m learning involves a different kind of leadership. I can’t plan as I might otherwise. Interim ministry isn’t just church as usual. It’s marked by transition and everything feels tentative. So, I can’t plan because what I need to do is listen. This is a bit terrifying to the über planner. It was especially horrifying when I recently realized that Lent was so soon very and I had nothing planned. I freaked out and then I started planning. I’m sharing those plans in full awareness that we are in this together and sometimes we need a little help from our colleagues to make it all happen. The church that I serve as an interim is a small, country church. They don’t tend to do anything programmatic on any other day but Sunday so planning Lent was really a matter of planning worship. There won’t be any adult education or special events to add to this congregation’s life. All that we experience together during this holy season will happen in worship. After worship, on most Sundays, I lead a sermon talkback conversation which is where the idea for this preaching series began. It was in one of those conversations a few weeks ago that I heard some really solid theological claims without much heart. Good theology has its place but this is a church that really wants to grow. It believes it can grow but not without heart. It’s not enough to spout good theology. There has to be some passion to it. There has to be some sense of why it matters. Here’s what I don’t know: I don’t know how this will lead into Holy Week. This congregation shares their observance of Lent with the local ministerium that hosts weekly worship on Wednesdays, including Ash Wednesday and Good Friday. I am not sure if this theme will play into how we journey into Jerusalem. That is something that I will need to listen for as we move through this season. I chose some of my favorite theological claims and dodged a few others. For example, I really didn’t want to do suffering servant because I know that’s not who my Jesus is and I’m not convinced I could preach good news on that particular claim. I do know that I need to push myself though so there are two books I’m hoping to read this Lent to push my own theological imagination. In the spirit of this preaching series, I’ll be reading James Martin’s Jesus: A Pilgrimage which just came out in paperback yesterday. I’m also going to attempt to read Jurgen Moltmann’s The Crucified God. That said, there is so much that could be added to this preaching series. I mean, really, it’s what we are preaching no matter what the season, right? So, there are certainly others that might be added and I would hope that this series would inspire some exploration on theological claims beyond these six. That’s something I’ll have to think about. What’s the best way to encourage such exploration within this particular congregation? Though this church is a small church that won’t have any specisl educational experience to build upon our shared experience in worship, I do have something to offer if you’re a last minute planner. Several years ago, I wrote a curricula called Toward Transformation with the good people of the First Congregational Church UCC in South Portland, Maine. It is a six-week study that navigates the Psalms in a desire to experience resurrection individually and communally. 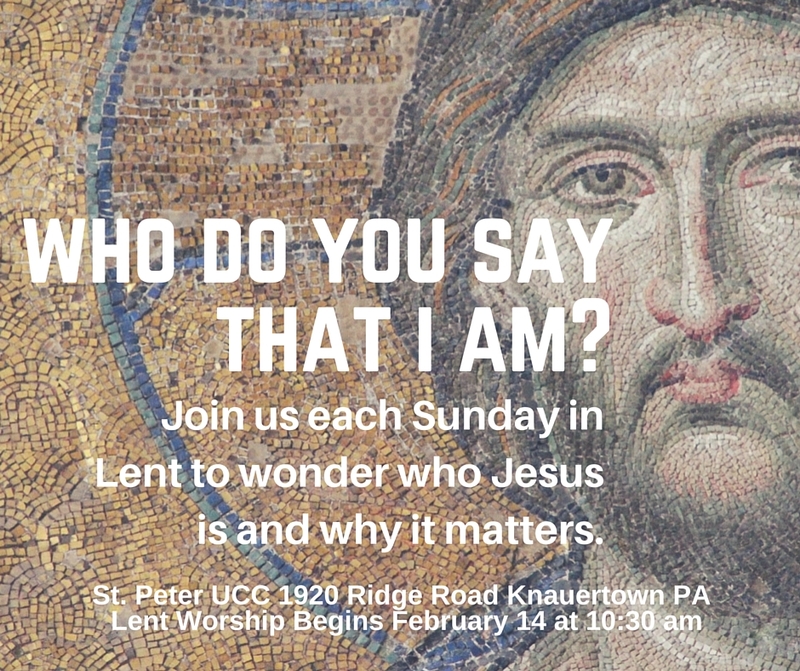 As worship tackles the question of who Jesus is and why that particular confession matters, this six-week experience might bring those questions to life in a slightly different manner. Admittedly, it’s not a perfect fit but I have to say it’s pretty awesome. Both times I’ve used it, it has led to some really awesome changes. You can download the resource from my Ideas + Resources. Maybe you’re not interested in that so much as you want to know about the graphic. Want to make your own cool graphic for your church newsletter or social media campaign? I used Canva. Once you’re logged in, choose the Facebook Post option. You can choose any one of the free designs. (Why pay?) The one I chose seems to have disappeared. Sorry! Once you choose a template, you’ll need to replace the image with an image of Christ. Maybe you take a picture of one in your Sunday School classroom or in the stained glass in the chapel. I admit that this particular image makes it a little hard to read the text. Alas! Add your church information including address and worship time and hit download. Look how fancy you are! How are your plans for Lent going?